Committed to an extensive training program and the monitored development of competent Traffic Management Operatives, we, mentors at one of the industry’s leading training providers, will share our knowledge and combined industry experience of over 100 years with the successful applicants throughout the term of the contract. Each successful applicant shall be guided through an extensive training package of up to 15 nationally recognised & certified vocational qualifications, now worth in excess of £7,000, as detailed below. Successful candidates shall hold a full UK drivers licence. GSCE English and Maths or functional skills desired but not essential. We also have a careers day taking place at our head offices in Birmingham on Wednesday December 14th where we will be interviewing people for the apprenticeship scheme as well as other opportunities we have coming up in the Highways sector. 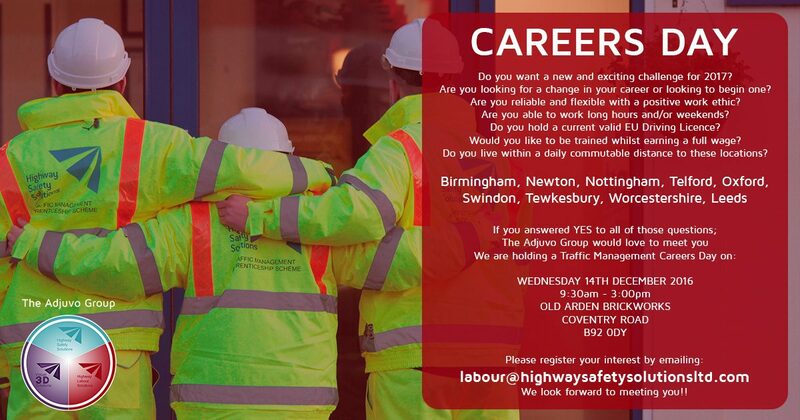 To register your interest send an email with your details to labour@highwaysafetysolutionsltd.com and we will be in touch to arrange an appointment with you.